Bohol is one of the pilot provinces chosen for the Conditional Matching Grant to Provinces (CMGP) for Road Repair, Rehabilitation, and Improvement. 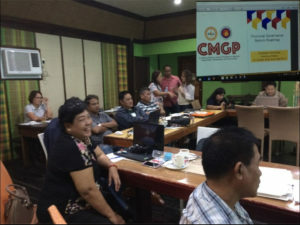 CMGP is a novel partnership program between the Department of the Interior and Local Government (DILG) and Department of Budget and Management (DBM) for Provincial Governments beginning 2017. It aims to partly address the needed infrastructure support, as well as reforms in local roads management (LRM) and public financial management (PFM). As per DILG-DBM JMC No. 2017-2, CMGP is the successor of the KALSADA Program. It was initiated by the League of Provinces of the Philippines (LPP) and launched in Bohol in FY 2016 following the successful completion of the Provincial Road Management Facility (PRMF) that was implemented over 2000-2015. Funded by the Australian Government-Australian Agency for International Development (AusAID), PRMF included Bohol as one of the 10 beneficiary provinces of PRMF in the Visayas and Mindanao. One of the PRMF outputs was the Provincial Road Network Development Plan, which was later improved by the CMGP to Local Road Network Development Plan. From this plan, the Provincial Governance Reform Roadmap (PGRR) for CY 2019-2022 was formulated as required by the CMGP. The PGRR illustrates the performance targets for each reform area and the strategies to achieve and sustain these reform agendas. Its implementation will positively impact and contribute to the attainment of Sustainable Development Goals (SDGs) at the local level. DILG-Bohol led by Provincial Director Johnjoan Mende conducted a 2-day Workshop and Consultation on the Formulation of PGRR on Local Road Management (LRM) and Public Financial Management (PFM) last July 11-12, 2017 at Casa Rey Francis Pension House, Tagbilaran City. With technical assistance from the United Nations Development Programme (UNDP) Consultant Evan Arias, the workshop was facilitated by CMGP Regional Coordinator Bernadette Camilo and fully participated in by the members of the Local Finance Committee and members of the Local Roads Management Team of the Provincial Government of Bohol. A series of writeshops were conducted in the succeeding months to refine the plan with technical assistance from UNDP Consultant Rosa Antes. The Philippines is a signatory to the achievement of the global Sustainable Development Goals (SDG). The 17 SDGs are interconnected. 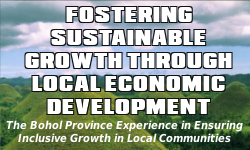 However, there are only five goals that are directly relevant to the CMGP, and their targets and indicators will be mainstreamed into national, sub-national, and local plans, by influencing budget allocations, and in this instance, the PGRR: Good health and well-being, Industry, innovation and infrastructure, Sustainable cities and municipalities, Responsible consumption and production, and Peace, justice and strong institutions (SDG Goals 3, 9, 11, 12 and 16). The PGRR was reviewed and finalized last October 12, 2018 by the Local Road Sector Committee composed of provincial government executive offices and the Sangguniang Panlalawigan, national agencies (DILG, DPWH), the academe and civil society organizations. It was presented to the Provincial Development Council Meeting headed by Governor Edgar Chatto on October 24, 2018 for favorable endorsement to the Sangguniang Panlalawigan, which approved it last October 26, 2018. The PGRR includes seven key reform areas for Local Road Management (Information Management, Network Development, Construction and Maintenance and Road Asset Management), and Public Financial Management (Internal Audit, Procurement, Budgeting, Revenue and Expenditure Management). The plan also includes Capacity Development, Monitoring and Evaluation Framework, and Communication Plan. The Provincial Government of Bohol submitted its PGRR to DILG Bohol and DILG-CMGP Region VII on October 30, 2018.